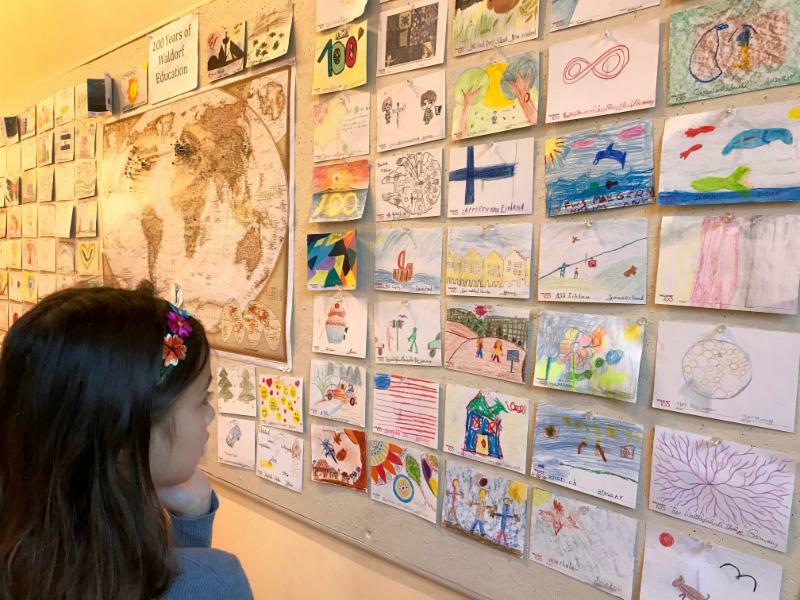 Montgomery, NJ: To celebrate the 100th anniversary of Waldorf education, Waldorf School of Princeton (WSP) students have joined a global initiative to connect with over 1,000 Waldorf schools all around the world. The project is simple: students at more than 1,100+ Waldorf schools will come together to write and design 1,100+ unique postcards to send to each of their sister schools. Waldorf100, as the idea is known, began in 2017, and the spark is rapidly spreading from school to school. The goal is to "... develop a global network that inspires and helps us to tackle the vital educational questions of our time with joy, fresh ideas, and courage." The halls of WSP are decorated with postcards from other participating schools alongside a map that marks the origin of each card. As the global political climate becomes increasing fractured and divisive, Waldorf students in Princeton and around the world are working towards a shared sense of community and understanding of diverse cultures. Each postcard contains an illustration or anecdote that communicates something about the students, telling or showing us something about their country, community, or values. The WSP community is excited to see how this initiative helps the students learn more about other cultures and come away with a deeper understanding of the common threads that unite them; breaking down the barriers that separate us. "This has been an inspiring exercise for the children," says Pamela Shafer, who teaches practical and fine arts. "They are gaining an awareness of something larger than themselves, understanding their place in history and the history of this school. When they see the pins on the map they feel connected to their peers around the world." This idea is generating a deeper understanding of geography and place, she explained, and more importantly it is "child to child-an opportunity to enjoy the mind of the other child." The postcards will be completed and mailed to all 1,100+ schools in time to kick off the 100th anniversary of Waldorf education in 2019.